Elaine is not just any chick. She’s one of my great friends that I’ve kept in touch with over the years. Elaine as in Elaine Russo, now Elaine Lemmer. 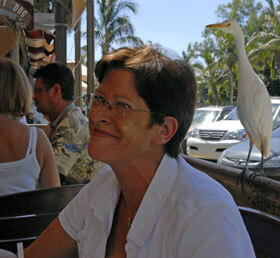 Tom, Rob and I met Elaine for lunch at Siesta Key Village. Speaking of getting kicked out of places. We started out trying to go to the Siesta Key Oyster Bar but just as we were walking up the sirens went off and we had emergency vehicles and were told we’d have to vacate due to a gas leak. So we went next door to the Daquiri Deck, sat down and ordered beverages. Then we got kicked out of there due to the whole gas leak thing going on next door. They cleared about a whole block, including blocking the road. So we headed on down to the Old Salty Dog and finally got to eat a great grouper sandwich and visit. What a great morning.